Adaware Web Companion - Prevent malware infections and privacy breaches at its source. Prevent malware infections and privacy breaches at its source. 2. Search for browser.search.defaultenginename and double click on it. How do I uninstall Web Companion from my computer? For Windows 8 & 10: 1. Go to Charm bar (key + C) and then "Settings", then "Control Panel"
2. Choose "Programs and Features"
1. Click the "Start" button and select "Control Panel"
In case you want to restore your homepage and search engine to what they were before installing Web Companion, just check the boxes during uninstallation process. 3. Select the add-on you wish to disable. 4. Click its Disable button. 5. Click Restart now if it pops up. Your tabs will be saved and restored after the restart. 1. On your browser, click menu. 3. To turn off an extension, uncheck the Enabled box. Check the box to turn it on. 2. Tap or click the Tools button, and then tap or click Manage add-ons. 3. Under Show, tap or click All add-ons, and then select the add-on you want to delete. 4. If the add-on can be deleted, you'll see the Remove option. Tap or click Remove and then tap or click Close. What does Adaware Web Companion protect me from? Adaware Web Companion protects you from malicious website or fraudulent websites that deliver malware infections, phishing attacks, exploits, malicious or unauthorized redirections and browser hijacks. How do I know if I'm visiting a malicious site? When Adaware Web Companion is running, you are protected against malicious websites. If you visit a malicious website, Adaware Web Companion will instantly notify you with a warning page. From this page, you can choose to continue to the site or return back to safety. When you visit a malicious website, Adaware Web Companion alerts you with a warning page. Is Adaware Web Companion compatible with other antivirus products? Yes. Because Adaware Web Companion is not an antivirus product, it is compatible with all other antiviruses on the market. Do I still need an antivirus if I use Adware Web Companion? Even if Adaware Web Companion protects you from visiting dangerous sites, it does not replace an antivirus. Adaware Web Companion provides protection during your web experience, it does not monitor background processes nor does it analyze files on your computer or external drives. This is why it is strongly recommended to always use an antivirus along with Adaware Web Companion. To download Adaware Antivirus, click here. What are Adaware Web Companion system requirements? Note. 4.5 or higher version of Microsoft Windows Installer is required for installation of Adaware Web Companion. * Your computer must meet the following system requirements in order to run the application effectively. What browsers does Adaware Web Companion support? Other browsers can still benefit from the Malicious URL Web Protection, but unfortunately cannot be protected from homepage and/or search hijacking. I did not ask to Install Web Companion. How did it get on my PC? Web Companion is most commonly distributed within another software product that you or someone who uses your PC has elected to install. This is known as "bundled software distribution" and is a practice widely used by software makers worldwide to make money while delivering free software to their end-users. Most software vendors simply don't make enough money through paid licensing to continue their operations. Adaware goes to great lengths to associate itself with only reputable software vendors, and also to ensure that the consent screen is clear and accurate. Despite these efforts, many users will inadvertently (due to no fault of their own) accept to install Web Companion and wonder how it ended up on their PC. Web Companion exists to protect users from this exact outcome, so we make sure the uninstallation process is as simple as possible and that any modifications of the configuration of the user's PC are simple to revert. The installation/update seems to be stuck, and is not progressing. What should I do? Web Companion uses Microsoft's MSI technology to install software on Windows PCs. One of the prerequisites for installing a product via MSI is that there is no other program currently being installed or uninstalled. It can often happen that another program is silently installing or uninstalling itself (e.g. Windows Updates) or that the locking system to protect against concurrent installs is stuck. In either case, Web Companion's installer will appear to hang. When this happens, we recommend rebooting the PC to complete any ongoing installations and reset the state of the installation locking mechanism, and try again. Why does Web Companion keep telling me that my search engine or homepage has been modified? Web Companion is periodically checking for changes to your homepage and search engine across all your installed browsers. It notifies you when it detects a difference between those settings and what is configured in Web Companion, and prompts you to accept the change or revert to what is set in Web Companion. It will do this 3 times before giving up. * Web Companion does not detect a specific program installed on your PC that is changing your browser settings. New programs (and versions) are released all the time, so this can be quite common. * Web Companion has detected the offending program, but the uninstallation process was unsuccessful. The program will still be present and will block changes to the settings. 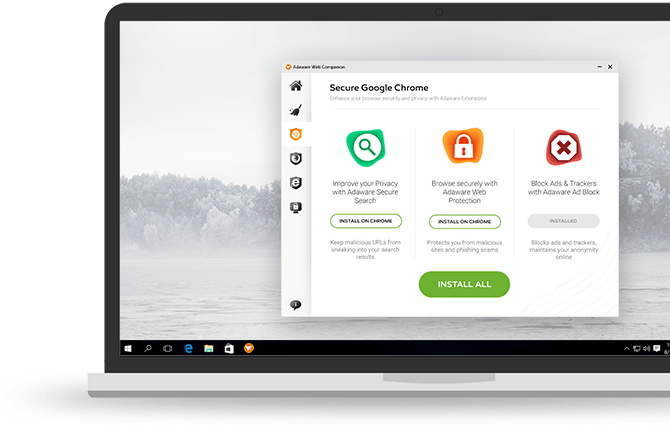 The browser has recently implemented additional security measures to prevent external programs from tampering with the settings. These measures affect both malware and security programs such as Web Companion. In all cases, we recommend that you report the situation to Adaware by sending us a snapshot of your system info (via the Web Companion UI) so that we can analyze the system and create a solution to the problem. Once resolved in house, we would roll it out to our user base in a subsequent product release or malware definition update. Adaware is currently working on techniques to make this process stronger and easier to follow. My antivirus program is flagging Web Companion as malware (or a virus). Why? Antivirus programs use a combination of sophisticated signatures and heuristics to assess whether or not a file is safe. Large teams of malware engineers build and update these detection databases and algorithms worldwide. The task is so daunting that competing antivirus vendors will share their detection databases with each other to increase protection. * False positive detection - The antivirus has accidentally (and incorrectly) flagged Web Companion. This often happens when one of Web Companion's file signatures accidentally matches another file that has been flagged. * Behavioural detection - The antivirus has detected a behaviour of Web Companion that it deems unsafe. Security products (like Web Companion) and malware often use similar techniques, so this can be a common occurrence. * Policy detection - Some antivirus products will automatically flag any file provided by a specific company (which it can do easily from the code signing certificate used to identify executable files). Sometimes this policy is merited, while other times it's used as a competitive tactic. In all cases, the correct course of action is to notify Adaware of the incident, and we will press to have the flag removed as quickly as possible.